NOTE: Hunting memberships are full for the 2016/17 season. Memberships are limited each month and all applicants must schedule a visitation prior to any application being accepted. Pistol memberships are for the use of pistol bays only. Unlimited memberships have access to all ranges. $35.00 guest fees apply to all members guest. Family plans includes spouse and any sibling 21 and under. The Initiation Fee is a one time fee. If for any reason a member does not renew and later decides to rejoin the initiation fee is waived. 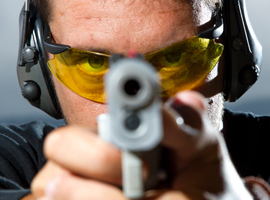 New Members are required to attend a Safety/Orientation class prior to having access to the range. Memberships start the day of orientation and will be renewable by member in good standing one year from that date. Orientation for new members is 2nd Saturday of every month unless scheduled otherwise. Any applicant applying for Unlimited membership must have a general knowledge of rifle zeroing skills and be required to shoot a 5” MOA group at a 100 yards the day of orientation before having access to any long range bay. Includes shooting pistol, rifle, and shotgun in small bay areas only. Unlimited memberships have access to all ranges. Family membership is spouse and any siblings 21 years old and under. Membership is lifetime for all family members. 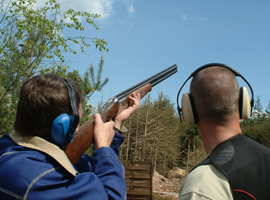 Click here to view Range Rules in PDF format. Covered 50 to 100 yard sight-in range. Covered 100, 200, 300, 400, 550 yard rifle range. Private, low-restriction club with limited membership. Convenient location near Raleigh-Durham NC. Monday - Saturday: 8:00 AM until sunset. Sundays: 12:00 Noon until sunset. WHRC is not open to the public. Please do not call and ask about access unless you are interested in a membership.